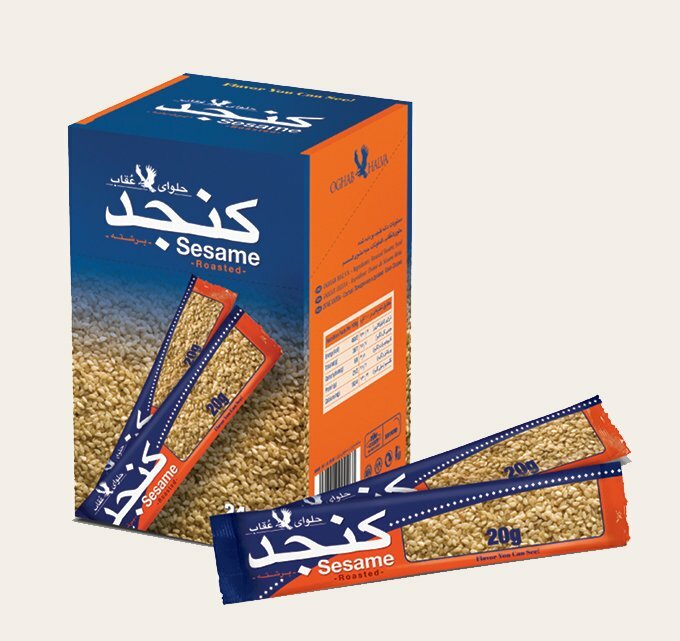 Sesame seed (Sesamum Indicum-L) is being cultivated in some parts of the world especially Asia and Africa because of the high amount of protein and eatable oil. The sesame fruit is something pod-like which is rectangular in the lower parts, has deep grooves and is triangular at the tip. In each pod of sesame fruit there are 50-100 sesame seed approximate. Sesame seeds are pear-shaped and small, the length of them are ranged from 2.5 to 4 mm and the width of the is 2.5 mm, pretty flat and with the outer shell with the colors of white, yellow, gray, reddish-brown and black. 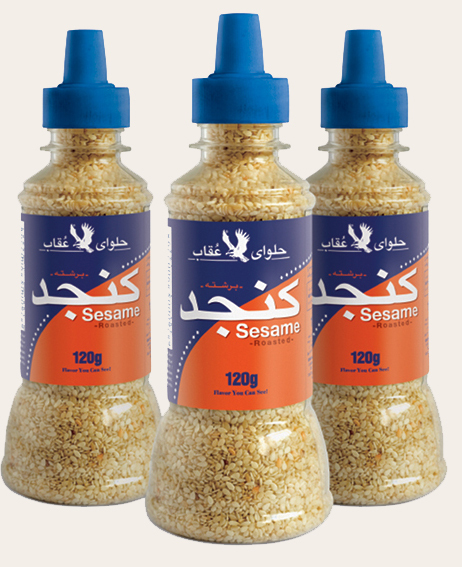 Sesame is being cultivated in 16 provinces and in an approximately 50 hectares of area in Iran. 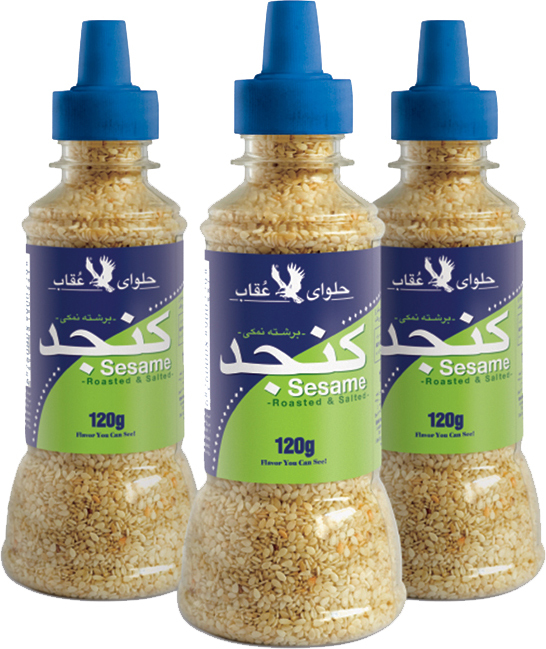 Sesame seed is a full of protein and fat source and therefore has got a high nutritional value. 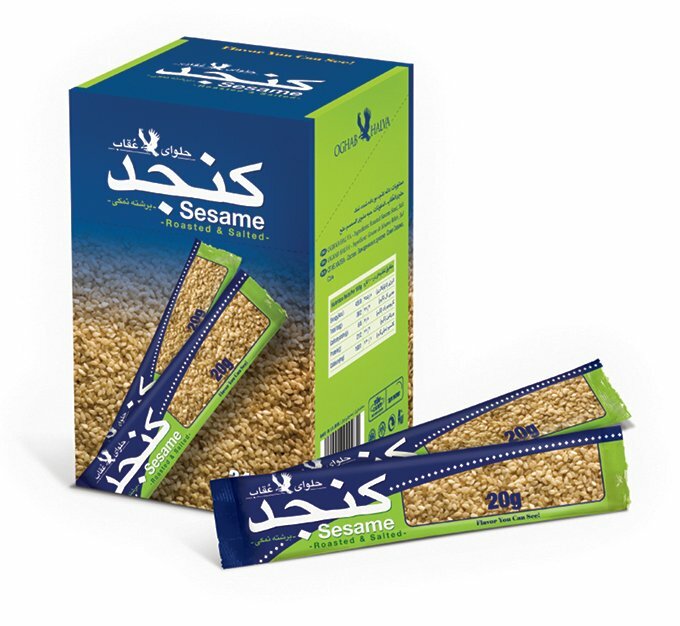 Oghab is a reliable company in the production of sesame-based products with more than half a century experience which tries to enhance Iranian families’ level of health with the production of a variety of skinless sesame seeds with the highest quality. This product is a useful and nutrient product which is being sold in 20-gram packages for instant use and 120-gram packages for kitchen use. After skinning process and roasting in normal or salty taste, the product is packed in small, beautiful and easy to open packages which are filled with nitrogen gas and becomes ready for instant use as a snack for every age group specially children and students due to strengthening of the bones, improving memory and learning. 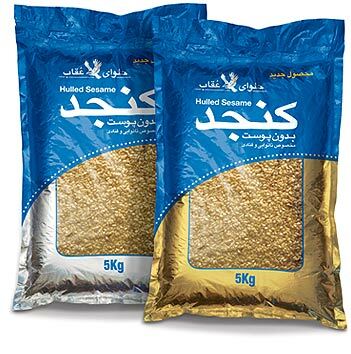 Oghab also produces 5 kilogram packages for the use of food industry companies, confectionaries and bakeries in two types of white and roasted. After skinning process and roasting in normal or salty taste, this product is packed in PTE bottles filled with nitrogen gas with beautiful design and two-part lid for easy use. This product is mostly used for kitchen use and can also be used in making different kind of foods such as sweets, pizza, fried chicken, salads and desert. After skinning process and depending on roasting situation, this product is produced in two types of raw (white) and roasted (golden), packed in light and moisture resistant packages and produced in two shrink way. This product is used for bakery, confectionary and food industry use and is used in different products such as biscuit, cake and chocolate.